So This week I have only finished 1 project. 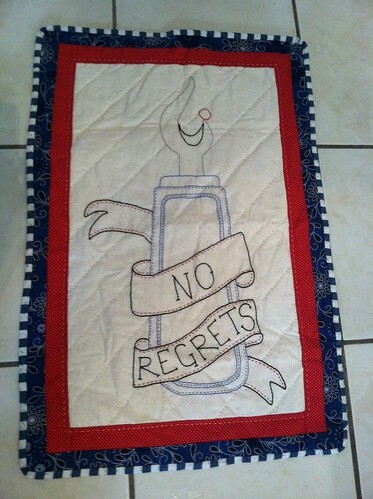 My "No Regrets" wall hanging, which I am in love with. Took it to guild meeting and it was a hit. 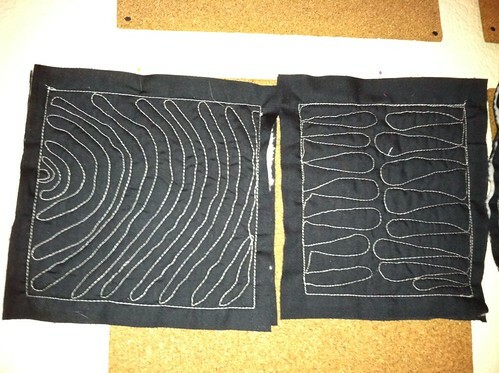 I'm thinking about making a pattern and selling it on Etsy but I don't know how to make a pdf pattern. Might have to call my girl Google on that one. I also started a new project. I found 3 matching men's shirts at a local thrift store for $2 each. 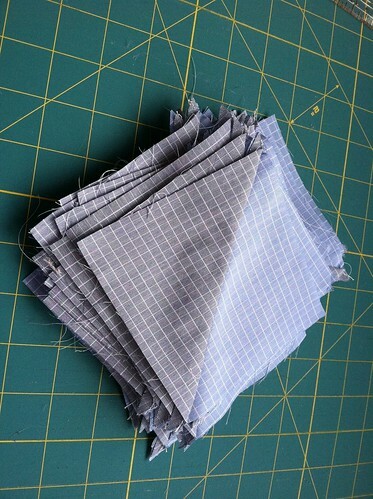 I cut them up over 2 months ago into HST's but this week I finally started sewing them together to become what I think will be my first boy quilt. What do you think? 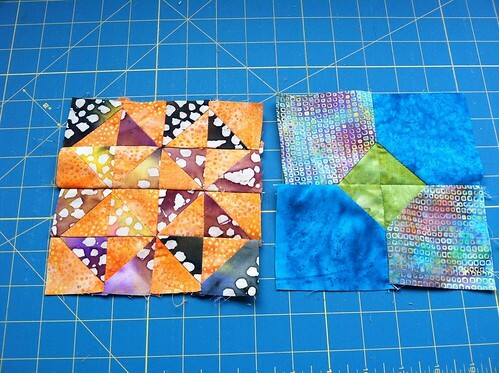 This is a sample layout with a few of the blocks. Still playing with them. 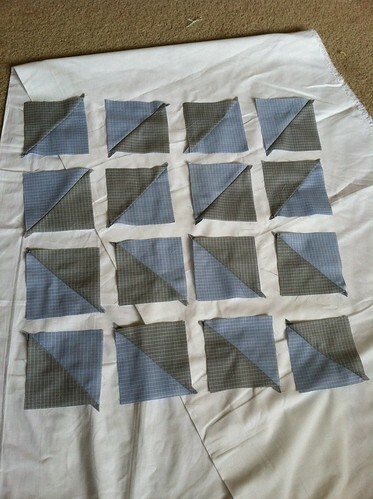 I know I want to do white sashing because I want to do some hand quilting on the edges of the sashing in grey/blue. I just need to get some white Kona because the crap I bought from Joann's is completely see through... blah, I knew I should have just sucked it up and spent the extra money in the first place. 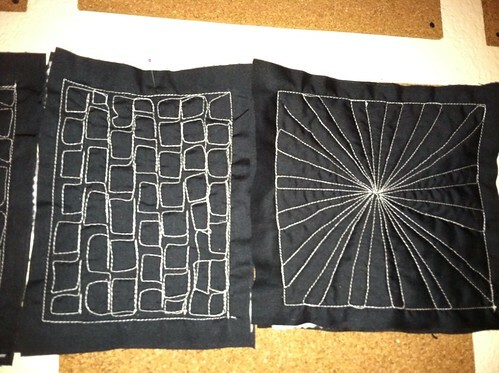 I also started the Free Motion Quilting at Fluffy Sheep Quilting. I got 4 done in one night. I have 2 more sandwiches prepared, just need to bite the bullet and do some more. This brings my total to 11 completed blocks, 100 to go. Oh dear.. I'm working on more projects but just don't have time to list them here so come back and see what else I'm working on! Thanks for visiting and thank you Freshly Pieced for hosting WIP Wednesday!! 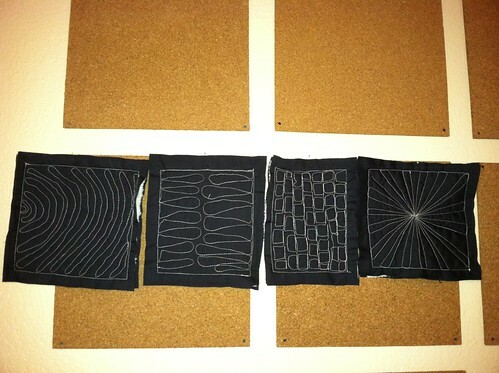 I love your wallhanging and the quilt from shirts looks great! I recently joined up with FMQ Friday too and it's so much fun! I still have to catch up on the tiles one though :) Your FMQ looks fantastic!